t*rexes and tiaras: Get Dressed.. So, when I discovered Dressed App a couple of weeks back, I was super excited. I'm not really a big "apps person" but a virtual closet? Um, where have you been all my life?! Clearly I downloaded it, and got to work right away on loading all of my clothes into my new virtual wardrobe. This can be done in a few ways - you can either take photos (the app gives you a template shape which is helpful) and erase any pesky edges, use images from the web, or use the templates to add new items into the wardrobe, which I've found is a lot quicker and easier to do with my handmade items (you can take a photo of the print, like I've done with the tape measure print dress which Roisin sent home with me last weekend. Your wardrobe is split into sections for the different types of clothes you might want to add, and each time you add an item you can put in details such as the brand and the cost, as well as the date you bought it, which seasons you'd wear it, etc. All of these things make it easy to filter your wardrobe to suit the weather, or the occasion. So far, I've found the app really easy to use and have been adding a few things at a time as and when I have a few spare minutes (apparently I have a lot of clothes - who knew?!). I know I still have a long way to go, particularly with my shoe collection, but it'll get there. Once your clothes are in your virtual closet, it's time to try them on. 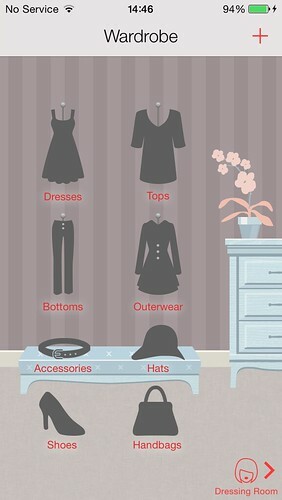 You can scroll through the different categories and get your model to wear them, in the Dressing Room. This will allow you to choose how you'd like to layer items, and is pretty useful for seeing how things are going to look before you wear them. Also, the graphics are really cute. Would you like to give it a try? If so, I'm running a giveaway below for a copy of the app, which is suitable for iPhones. I have five copies to give away, so fill in the Rafflecopter widget below, before Sunday - there are lots of ways to enter. Good luck!! Haha, I have a few now. We tend to swap when we have clear outs! wow i feel old...i first watched Clueless in my teens and i fell in love with that closet, it's what inspired me to love fashion, i wanted to be Cher so bad. I will give this app a try. Apparently nobody could believe that I'd made it to 25 and never seen it! Gasp - that's just like Clueless!!! It's such a cute idea - it really is!